I love this card! I will buy some Twilight books that you can borrow, if it means you will make me a stack of cards! :) j/k. I love your work though! P.S. I tagged you twice now...one where you write about your spouse and the other where you write 8 things about yourself. If you ever do tags on your blog then you can check them out! P.P.S. How are my cute nieces? What are they going to be for Halloween? Cute, Cute Card! That stamp is adorable! Who makes it? On second hand maybe it would be too dangerous for me to know the company name! 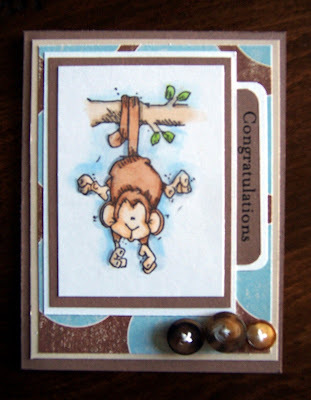 ;) Know what some other super cute stamps are?--High Hopes Rubber Stamps. Have you ever heard of them? I just discovered them. They're my favorite favorite stamps. I have some (quite a few--blush)if you ever want to come stamp some images. Then you can take them home and color them whenever you have time. Let me know. You are so talented! We'll have to get together again so some of your creativity can rub off on me!